Monday 12 November: Delayed (11am) opening in all NLI sites, plus NLI Reading Room and Manuscript Room closed all day. Venue: National Library of Ireland, Kildare Street, Dublin 2. Delayed opening due to staff development meeting. On-going Monday closures are facilitating extensive redevelopment of the premises. All other services/exhibitons/cafe, including Genealogy Advisory Service, operate as normal. Details. Monday 12 November: The Priest's Tale, with Caoimhe Whelan. Host: More Tales of Medieval Dublin lecture series. Venue: Wood Quay Venue, Dublin City Council, Wood Quay, Dublin 8. Admission free. All welcome. 1:05 - 1:50pm. Monday 12 November: The Dungannon Gold Rush, with Aidan Fee. Host: Donaghmore Historical Society. Venue: Donaghmore Heritage Centre, 15 Pomeroy Rd, Dungannon, Co Tyrone BT70 3HG. 8pm. All welcome. Tuesday 13 November: Church of Ireland Records – more than just registers, with Derek Nielson. Host: Genealogical Society of Ireland. Venue: Dun Laoghaire Further Education Institute, Cumberland Street, Dun Laoghaire, Co Dublin. 8pm. All welcome. €3. Tuesday 13 November: Interpreting your DNA results, with Martin McDowell. Host: North of Ireland Family History Society, Lisburn Branch. Venue: Bridge Community Centre, 50 Railway Street, Lisburn BT28 1XP. 7:30pm – 9:30pm. Free. All welcome. Tuesday 13 November: Three Dublin families in WW1, with David Power. Host: Tallaght Historical Society. Venue: County Library, Library Square, Tallaght, Dublin 24. 7pm. All welcome. Thursday 15 November: Irish Records? They all went up in smoke... didn't they?, with Jill Williams FIGRS of the Irish Genealogical Research Society. Host and venue: Ayrshire Family History Society, Troon Portland Church Hall, South Beach, Troon, Ayrshire, Scotland. 7:30pm. Admission free. Details. Friday 16 November: The Spanish Flu: A Global Pandemic – a conference. Hosts: Ulster Museum in partnership with Living Legacies. Venue: Ulster Museum, Botanic Gardens, Belfast, BT9 5AB. Free but need to book ticket. 11am to 4pm. Friday 16 November: The Great War and Clare, with Joe Power. Host: Part of Clare County Library's Creative Ireland programme. Venue: Ennistimon Library, 10 Main St, Ennistimon, Co. Clare. Free. All welcome. 6.30pm. Saturday 17 November: Intermediate Irish records, with Jill Williams FIGRS of the Irish Genealogical Research Society. Host: Scottish Genealogy Society. Venue: Family History Centre, SGS Library, 15 Victoria Terrace, Edinburgh, Scotland EH1 2JL. 10am to Noon. To book, T 0131 220 3677 or book online. Saturday 17 November: The Great Hunger reassessed: a History Ireland Hedge School. Hosts: Dublin Book Festival. Venue: Dublin Port HQ, Alexander Road, East Wall, Dublin 3. Tommy Graham, editor of History Ireland magazine will chair the discussion with John Gibney, Patricia Byrne and Peter Gray. 2:30pm to 3:30pm. Free. Need to book. 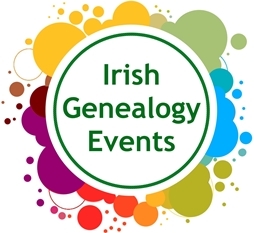 Saturday 17 November: Getting Started with Irish Genealogy Research, an introductory level workshop, with Miles Davenport. Host: McClelland Irish Library. Venue: McClelland Library's Norton Room, 1106 N. Central Avenue, Phoenix AZ 85004, USA. 10:30am-12:30pm. Fee: $15 for Library/ICC members and $20 for non-members. Sold Out.